Picture this: gingerbread porch, shining water, cold drink, peace! One of the best features of Marevista cottage is the large, welcoming porch. The wicker furniture and bay views make it the perfect spot to relax. You enter the cottage into the comfortable living room with plenty of seating.The large dining area offers room for enjoyable meals or a challenging family game. While the home maintains its old-fashioned charm, the kitchen was recently updated. Beyond the kitchen is the renovated bathroom decorated with bead board and cheerful colors. Across from the bathroom, the laundry area with washer and dryer is a convenience not found in many Bayside cottages. Up a narrow staircase, which may be difficult for some to maneuver, the 4 bedrooms and a small room with a single commode are arranged. The cottage sleeps 6 comfortably with its 1 queen, 1 double, and 2 single beds.Looking through the colored-glass framed windows, you can wake to glimpse the sparkling bay beyond the neighboring cottages and arise to another terrific day in Bayside! (More details below). Additional Cottage Details: • Living area: Sun streams through the colored glass framing the windows adding to the warmth of the wood paneling. There is a DVD player and a radio/CD player along with numerous board games and books. Plus free WIFI! • Bedrooms: Patchwork quilts and original artwork decorate these inviting rooms. Each room has at least 1 window and 3 have closets. Each room has a fan for warm evenings. • Kitchen: Beyond the numerous collectibles, in the large pantry cupboards, dishes, glassware, pots/pans, bake ware, utensils, are stocked for every type of meal. There is a blender, a waffle machine, a toaster, and a coffeemaker, And, of course, there is a pot large enough for lobsters! • Bathroom: Its large shower includes a seat (there is no bathtub). Lots of shelving for toiletries and towels. • Heat: there is baseboard electric heat on the first floor, but it's rarely needed in the summer months. • The back door leads to a small deck and access to the yard. An honor-system lending library, Northport yacht club offering sailing lessons, the shore with docks for swimming and fishing, historical society's museum, Northport Golf Club, and street after street of lovely architectural details and gardens. Hospital, doctors, dentists, pharmacies, groceries, hardware/home stores, churches, auto repair/supplies, public library, fast food to fine dining, pubs, parks, bakeries, ice cream shop, marina, theater (live and movies), etc. Brief History of Bayside: Marevista cottage was built in 1878. Originally a Methodist retreat, Bayside's visitors came by steamship and stayed in the large hotel at the top of Ruggles Park. Others stayed in tents and, within years, those tents evolved into the current gingerbread cottages throughout this historical village. Today, the residents, both year-round and seasonal, are a diverse mix of new families and descendants of some of the original families. Bayside is a step back to calmer and quieter times, where people enjoy chatting and storytelling with neighbors and kids make new friends readily. With all that Marevista cottage has to offer, it's definitely the place to come to do everything or to do nothing at all! The cottage has high-speed wireless Internet. Cell phone service is generally reliable. Home does not have a phone. Wonderful cottage to spend a week! This is picture perfect little Victorian cottage in Bayside. The decorative touches inside add so much to it's appeal. The surrounding area offers a wealth of things to do and places to eat. We enjoyed walking down the hill to the waterfront park and just sitting on the porch. My wife and I stayed in this cottage the 3rd week of July. I'm originally from the area and love mid coast Maine. The cottage is beautiful...like a trip back to a simpler time. The decorations are perfect for the interior of the cottage. It is well appointed with whatever you may need during your stay. We kept as busy as we wanted with trips to Acadia, Stonington, Castine, Camden, Winterport and of course Belfast. We also enjoyed a good deal of quiet time on the front porch. This is a highly recommended rental! We were very happy in Marevista cottage and would gladly stay there again. The cottage is clean and bright, with modern, comfortable furnishings. Having a washer and dryer on site is a nice perk. The bathroom and kitchen are larger and newer than most other cottages we have stayed in, and the bedrooms were all roomy as well. The owners were helpful and pleasant to deal with. The only reason I didn't give it the full 5 stars is that I reserve that rating for cottages on or overlooking the water. The Marvesta Cottage was a wonderful cottage. It is nicely decorated on the inside, the kitchen has everything that you need for preparing meals, especially the lobster pot(we used it a couple of times). The bedrooms are really nice as well. It is such a peaceful community and everybody is so friendly!!! The weather was perfect we may have had rain overnight but nothing during the days while we were there. Can't wait to go back in a couple of years!!! 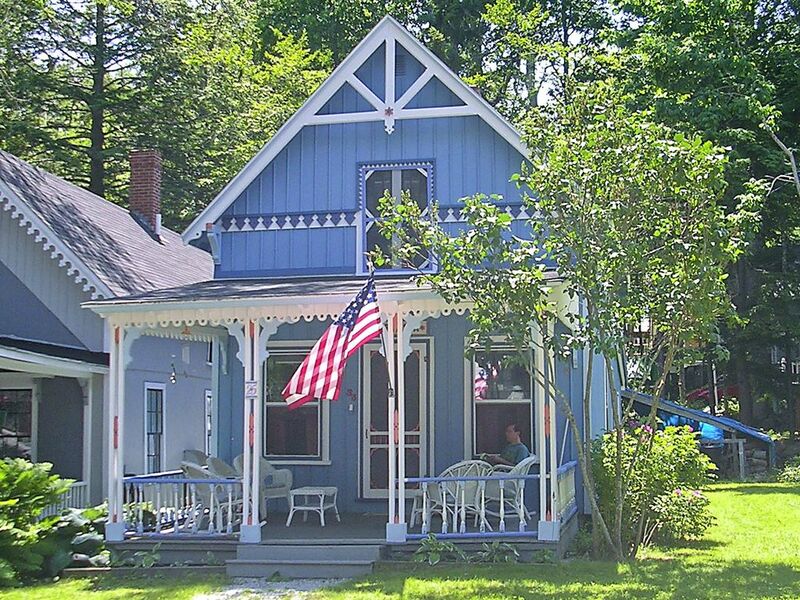 The Marevista Cottage was delightful with everything you need to enjoy a pleasant stay in Maine. We are four sisters who had plenty of room to relax and spend time together.It rained the two days we were there,however,that did not keep us from enjoying the many shops in Camden,Rockland and Belfast;all a short drive from Bayside.Of course,we can't forget the wonderful seafood dinners! Our stay at the cottage was great. Bayside is a unique little village with a fascinating history sold by some small interpretive signs scattered around the village. It looks much like it did in 1870 with many preserved Victorian style bungalows. Our September week was very quiet and restful and we did spend a lot of time on the front porch and walking down to the dock for kayaking on the bay. The cottage is well equipped and perfectly clean and we did not miss a TV at all. We enjoyed takeout lobster dinner from the Lobster Pound in Belfast and did daytrips to Camden, Bar Harbor and Acadia National Park. I would recommend a vacation to Mar Vista to anyone looking for a relaxing stay in an authentic cozy cottage. Bayside is a residential village located along Penobscot Bay, in Northport (mid-coast Maine). Filled with colorful, Victorian-styled cottages dating from the late 1800s, our peaceful cottage has views of the bay from the large porch and through the colored-glass framed windows. Relaxing on the porch is hard to beat, but you can also sail, kayak, hike, fish, swim, bike, golf, and enjoy a playground all within a short walk! About a mile away, there’s a new restaurant and a corner store with pizza, ice cream, and basic grocery needs. Ever-growing Belfast, 3 miles away, offers a range of eclectic local businesses to national chains that meet most needs. The area is full of lakes and parks, lighthouses, antique stores, art galleries and museums, a wide variety of boating excursions, and many seasonal festivals. Popular day trips include: Portland, Freeport, Camden, Bar Harbor/Acadia National Park. Of course, there's lobster. So, come to Maine and do everything or nothing at all! The cleaning deposit will be returned, if the cottage is found to be in the same condition as when rental period began. No smoking on the property. No pets. Towels and sheets are not included.